RiTEK DVD-R 4.7 GB Inkjet White Waterproof Glossy Printable, 50 ks bal. Vodeodolná lesklá potlač s vysokým rozlíšením tlače pre naozajstné obrázky plne High-End profesionálnej fotografickej kvality je odolná voči vode a vlhkosti. Nerozmazáva sa. Traxdata Waterproof Inkjet Printable je plne farebná s vysokým leskom vodeodolná tlač fotografickej kvality až k stredu v atramentových tlačiarňach. Médium zaradené do najvyššej kvalitatívnej TOP triedy A Grade. Pre excelentnú kvalitu masívne používané profesionálnymi kameramanmi aj amatérmi. Dlhá životnosť, vhodné pre archiváciu. RITEK Excellence Line Disc series is the revolutionized blank media to archive multiple data, offering the highest in disc and print quality, using RITEK´s exclusive and sophisticated production know-how, special designed and controlled production lines, and using a High Quality Japanese Dye, which resulted in a Highest disc and Quality on the market. It´s printable surface offers superior fast - drying ink absorption for clear text snd high - resolution photo - quality images, in combination with a superb profesional picture Print Quality. 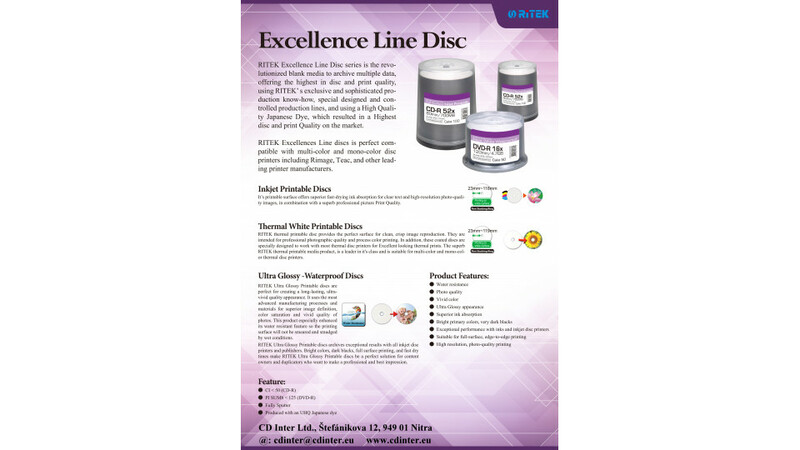 RITEK Ultra Glossy Printable disc are perfekt for creating a long-lasting, ultra - vivid quality appearance. It uses the most advanced manufakturing processes and materials for superior image definition, color saturation and vivid quality of pohotos. This product especially enhanced its water resistant feature so the printing surface will not be smeared and smudged by wet conditions. 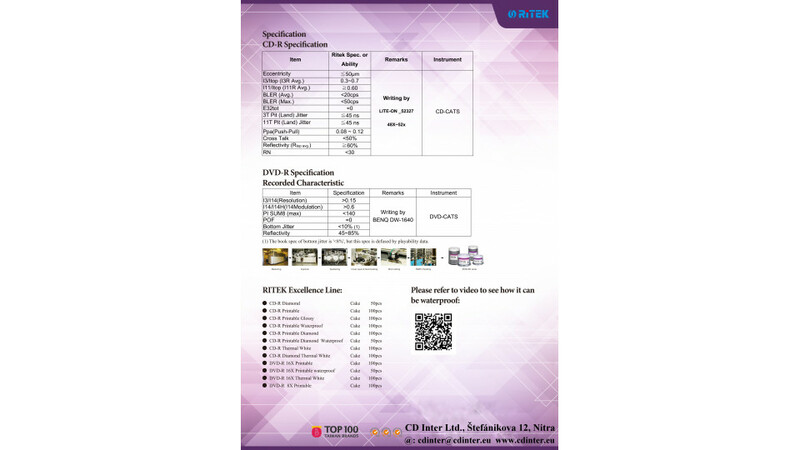 RITEK Ultra Glossy Printable disc archives exceptional results with all inkjet disc printers and publishers. Bright colors, dark blacks, full surface printing, and fast dry times make RITEK Ultra Glossy Printable disc be a perfekt solution for content owners and duplicators who want to make a professional and best impression.